Have you ever wondered: When do sharks know humans are in the water? How do they sense their prey? How small is the smallest Hawaii shark? 1. There are about forty species of sharks that occur in Hawaiian waters, ranging in size from the deep-water pygmy shark (about 8 inches) to the whale shark (up to 50 feet or more). 2. About eight species are somewhat common in nearshore waters. The most frequently encountered are the whitetip reef, sandbar, scalloped hammerhead, and occasionally tiger. 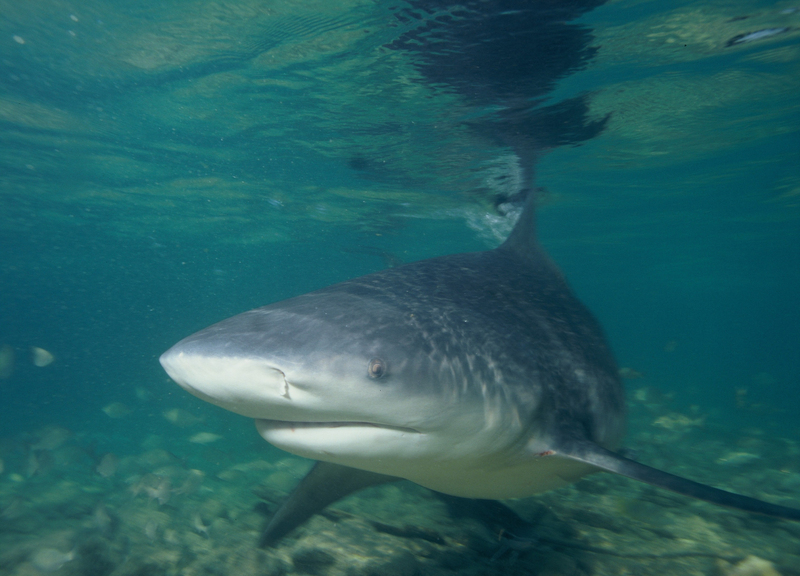 Tiger sharks are often attracted to stream mouths after heavy rains, when upland fishes and other animals are swept out to sea. They can easily locate prey in such murky waters. Tigers are also attracted to waters frequented by fishing boats, which often trail fish remains and blood. 3. These inshore species are top-level carnivores, feeding primarily on fishes. Their roles in reef ecosystems are not fully understood, though they may keep fish population sizes in check, and remove sick and injured fish, leaving the healthiest to survive and reproduce. 4. Sharks have extremely well-developed sensory capabilities. They can detect sounds and smells from prey at great distances (up to a mile or more, depending on water conditions). Their eyesight is good, but depends greatly on water clarity. 5. As sharks approach their prey, they can detect the faint electric fields given off by all living organisms. Receptors on their snouts, known as ampullae of Lorenzini, allow sharks to locate their prey without seeing it. 6. Using these and other senses, sharks can find prey at dusk, night, and dawn, which is when some inshore species are generally believed to feed. 7. Sharks are very much attuned to their environment. They know when people are in the water long before people are aware of them. Encounters between sharks and people are infrequent, and most inshore species pose little threat to humans. 8. In cases where the offending shark can be identified, tiger sharks top the list. A tiger shark is easily recognized by its blunt snout and the vertical bars on its sides. Hammerheads are also easy to identify, and have been implicated in a few cases where they may have been provoked. 9. Tigers are considered the most dangerous sharks in Hawaiian waters. White sharks, which are also very dangerous, are rarely seen in Hawaii. Because of their size and feeding habits, tigers occupy the very top niche in inshore feeding relationships. 10. For years tiger sharks were believed to be territorial in nature. Individuals were thought to remain for the most part in a fairly limited area. Recent evidence suggests this is not the case. Tiger sharks have been found to navigate between the main Hawaiian islands, and thus appear to occupy home ranges much larger than had been previously suspected. The pygmy shark only measures about eight inches long, and it's the smallest shark in Hawaiian waters. The whale shark can measure more than 50 feet long and is the largest shark in Hawaiian waters. 11. Tiger sharks are often attracted to stream mouths after heavy rains, when upland fishes and other animals are swept out to sea. They can easily locate prey in such murky waters. Tigers are also attracted to waters frequented by fishing boats, which often trail fish remains and blood. 12. Of all the inshore species, tiger sharks have the most widely varied diet. They eat fish, lobsters, birds, turtles, dead animals, even garbage, and may feed whenever a food source is present. It’s not known why tiger sharks sometimes bite humans. The idea that they mistake a person for a natural prey item, such as a turtle, is not supported by any evidence. The shark may be trying to determine if a person is a potential prey item, it may come across a person while in a feeding “mode,” or perhaps there is some other explanation. If you want to see sharks up-close, but still stay safe, book a North Shore Shark Adventure through Hawaii Aloha Travel. The two-hour tours are scheduled throughout the day from 7 a.m. You can dive, swim and view sharks from a secure metal cage and even take home photos and a video of your adventure. Even if you’re not a shark lover, it’s still important to know these Hawaii shark facts. Love it or hate it, their your swim companions every time you take a dip in the ocean!